Vitamin D is a steroid hormone that comes in 2 forms that differ chemically in their side chain, D2 and D3 (Figure 1). Either produced in the skin (D3) from 7-dehydrocholesterol by exposure to ultraviolet-B light or ingested with foods of plant or animal origin (D2 and D3, respectively), vitamin D is biologically inert and requires 2 hydroxylations to form its active metabolite.10 The first hydroxylation is constitutive and takes place in the liver by vitamin D-25-hydroxylase to form 25(OH)D. The second hydroxylation is catalyzed by 25(OH)D-1aOHase (CYP27B1) to form the biologically active form of vitamin D, 1,25(OH)2D (calcitriol). This latter 1a-hydroxylation of 25(OH)D takes place in most tissues and cells of the body; however, serum levels of 1,25(OH)D are determined mainly by renal 1a-hydroxylase activity. This activity is regulated by serum calcium, phosphate, parathormone, and fibroblast growth factor 23. Although the exact mechanism for such a pathogenic role has not yet been fully established, it was found that the promoter region of the insulin gene contains vitamin D–responsive elements, postulating a direct regulation of its transcription by 1a,25(OH)2D3.102 Additionally, insulin secretion is a calcium-dependent process, and vitamin D is known to regulate the calcium flux and intracellular cytosolic calcium [Ca]2+i pool in the pancreatic β cell. Intriguingly, pancreatic β cell expresses 1a-hydroxylase and 24-hydroxylase, indicating a possible autocrine link between vitamin D status and pancreatic function. In any case, both committees used skeletal health as an end point, and they both concluded that the available scientific evidence supports a causal role for vitamin D only in skeletal health but is not yet compelling that either confers benefits for or is causally related to non–skeletal health outcomes like CVD. Thus, prescribing vitamin D supplementation for the purpose of preventing CVD beyond recommended daily needs cannot be recommended. The Endocrine Society Task Force suggests using either vitamin D2 or vitamin D3 for the prevention and treatment of vitamin D deficiency. However, there is currently a lack of clarity in the literature as to whether there is a definitive difference in the potency between D2 and D3 as modulators of bone metabolism factors, and it is more unclear whether any differences translate to different effects of these 2 forms (D2/D3) on cardiovascular risk factors. Taking into account that pharmaceutical preparations in some countries (ie, the United States) contain only vitamin D2 whereas multivitamin preparations contain either D2 or D3, the identification of possible differences is of great importance in suggesting the use of one or the other form for achieving favorable effects on cardiovascular risk factors. 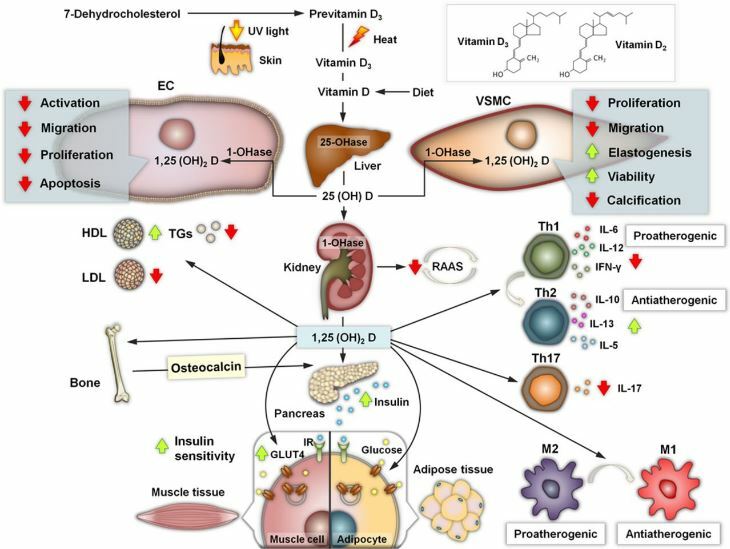 Details on the treatment of vitamin D deficiency in special conditions and the re-evaluation of the subjects supplemented with vitamin D are provided in the online-only Data Supplement. Osteocalcin is the most abundant noncollagenous protein of bone matrix. Once transcribed, this protein undergoes posttranslational modifications within osteoblastic cells before its secretion, including the carboxylation of three glutamic residues in glutamic acid, which is essential for hydroxyapatite binding and deposition in the extracellular matrix of bone. 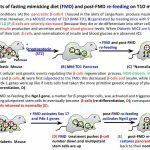 Recent provocative data from experimental observations in mice showed that the circulating undercarboxylated fraction of osteocalcin increases insulin secretion and sensitivity, lowers blood glucose, and decreases visceral fat in both genders, while it enhances testosterone production by the testes in males. Moreover, both total and undercarboxylated osteocalcins increase following physical activity with potential positive effects on glucose tolerance. Despite that these evidences have been only in part confirmed in humans, further prospective investigations are needed to definitively establish the endocrine role of osteocalcin both in the general population and cohorts of patients with diabetes or other metabolic disorders. Endocrine actions of osteocalcin. Circulating osteocalcin and particularly its undercarboxylated fraction (released during active bone resorption) exert a direct effect on β cells, stimulating insulin production as well as on adipocytes enhancing adiponectin production. 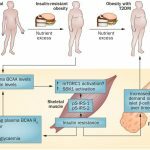 Adiponectin itself is able to promote insulin sensitivity. 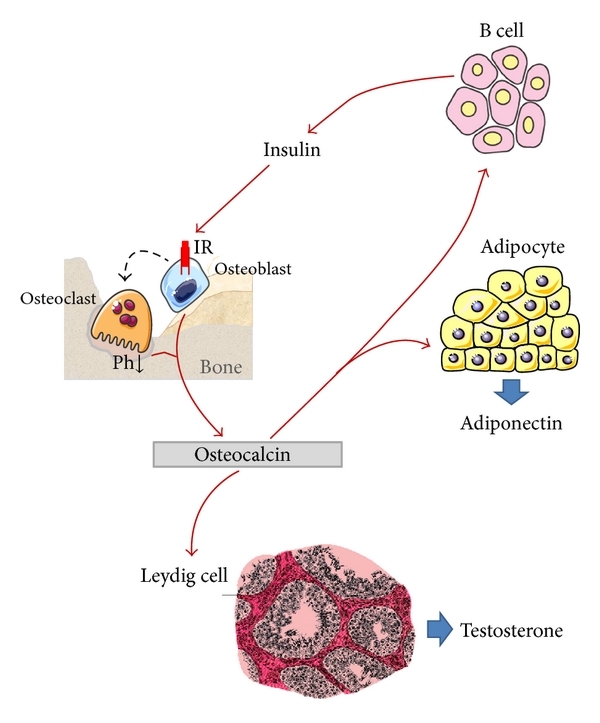 In turn, insulin also acts directly on osteoblast and indirectly on osteoclast. Osteoclast stimulates bone resorption with subsequent release of undercarboxylated osteocalcin in blood circulation. Finally, osteocalcin has a role also on Leydig cells, increasing their activity and testosterone production. Osteocalcin synthesis in osteoblasts. The BGLAP gene encoding osteocalcin is mainly expressed in osteoblasts and to lesser extent odontoblasts. After transcription (which is stimulated by vitamin D) the preproosteocalcin peptide undergoes proteolysis giving rise to a prepeptide (23 aa) and a proosteocalcin peptide (75 aa). The latter can be carboxylated at Glu residues 17, 21, and 24, resulting in formation of Gla residues in a vitamin K dependent process. Generally, this process only occurs in a proportion of newly synthesized pro-osteocalcin. 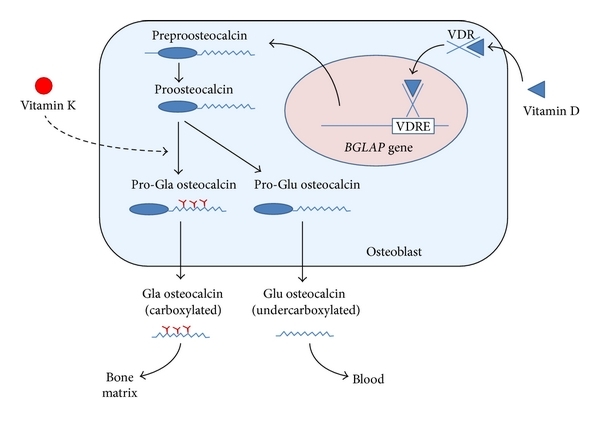 Then Gla and Glu pro-osteocalcin peptides are subjected to a final proteolytic process that produces, respectively, carboxylated and undercarboxylated osteocalcins. Both forms are released from osteoblasts in a process which is calciumdependent. While the carboxylated Glaresidues are involved in calcium and hydroxyapatite binding, allowing osteocalcin deposition on mineralized bone matrix, undercarboxylated osteocalcin has a low affinity for hydroxyapatite and is more easily released into the circulation. Bone remodeling cycle. 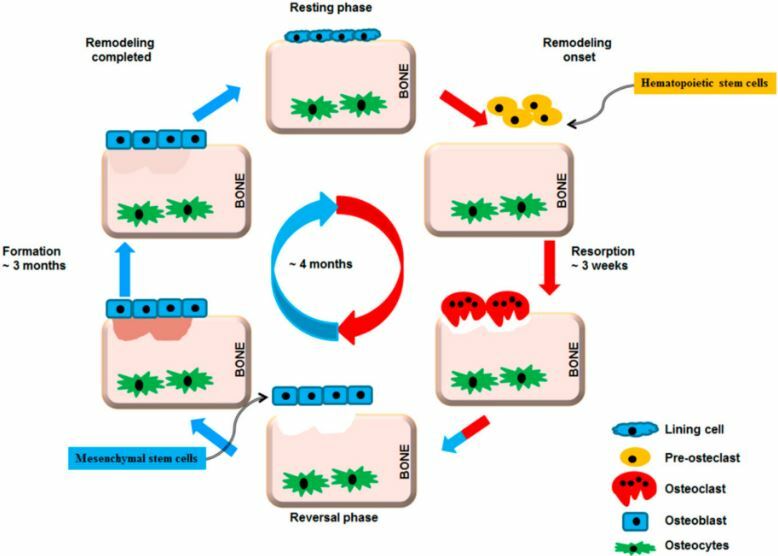 A remodeling cycle is initiated by osteoclasts that solubilize bone mineral and degrade the matrix (resorption phase). Osteoclasts originate from hematopoietic stem cells which differentiate first into pre-osteoclast cells which fuse to form multinucleated cells (activated osteoclasts). Monocytes/macrophages remove debris (reversal phase), followed by a bone formation phase performed by osteoblasts, producing osteoid matrix which will mineralize. Growth factors are released from the bone matrix during resorption, which increase the pre-osteoblast population in order to replace damaged bone surfaces. Osteoporosis is a major public health problem affecting the elderly population, particularly women. The objective of the study was to evaluate the effects of adding weight-bearing exercise as opposed to nonweight-bearing programs to the medical treatment of bone mineral density (BMD) and health-related quality of life (HRQoL) of elderly patients with osteoporosis. Participating in the study were 40 elderly osteoporotic patients (27 females and 13 males), with ages ranging from 60 to 67 years, who were receiving medical treatment for osteoporosis. They were assigned randomly into two groups: Group-I: Twenty patients practiced weight-bearing exercises. Group-II: Twenty patients did nonweight-bearing exercises. All patients trained for 45-60 min/session, two sessions/week for 6 months. BMD of the lumbar spine, right neck of femur, and right distal radial head of all patients were measured by dual-energy X-ray absorptiometry before and after both treatment programs. In addition, the QoL was measured by means of the HRQoL “ECOS-16” questionnaire. T-tests proved that mean values of BMD of the lumbar spine, right neck of femur and right distal radial head were significantly increased in both groups with greater improvement in the weight-bearing group. The QoL was significantly improved in both groups, but the difference between them was not significant. Addition of weight-bearing exercise program to medical treatment increases BMD more than nonweight-bearing exercise in elderly subjects with osteoporosis. Furthermore, both weight-bearing and nonweight-bearing exercise programs significantly improved the QoL of patients with osteoporosis. Optimizing bone health isn’t as simple as getting enough dietary calcium. Beyond the obvious importance of this mineral, other factors, such as vitamin D and magnesium intake, low-grade systemic inflammation, weight-bearing exercise, and intestinal health, also impact bone mineral density, and vitamin K2 should be added to the list. 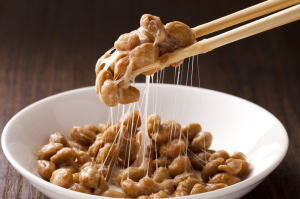 Since 1995, high doses of vitamin K2 supplements have become an approved treatment for osteoporosis in Japan where studies support its benefit in the prevention of further decline in bone mineral density. Some women have experienced an increase in bone mass as a result of this intervention.1 Although these results are promising, more studies are needed to confirm their applicability to other populations.